The Samsung Galaxy Ace S5830 is a very popular low-end Android phone that has managed to survive in the market for a very long time. To cash its popularity, Samsung released various variants of this phone but no one could match it. If you own this little powerhouse (in a moderate sense) and want to install a stock firmware on it manually, this is probably the best place for you. The reason for installing a stock/official firmware to your Samsung Galaxy Ace S5830 could be many. 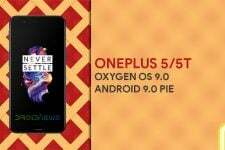 You may download the latest firmware for your phone and flash it to upgrade the Android OS. Some folks lose the warranty of their phone by rooting it or installing a custom ROM. By returning back to the stock ROM, you can reclaim the warranty. You might also wish to install the official firmware on your Galaxy Ace in case your phone is stuck at a bootloop a or some other problem. I got the idea to write the present tutorial on the request of a visitor who fell to the last situation. You need to make some preparations before you can install the stock/official firmware on your Samsung Galaxy Ace. 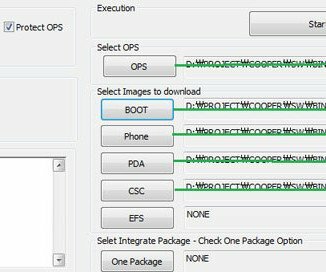 Download Cooper_v1.0.ops file that will be needed each and every time you flash a custom Recovery or a stock firmware. Charge your Galaxy Ace’s battery fully. Backup your contacts, message, and apps, etc. Turn on the USB Debugging mode from Settings> Applications>Development> USB Debugging> check the box. Having made sure that you have come up to all prerequisites described above, let’s move on to our next destination. Open the firmware extracted folder and see how many files are therein. The method of installation for single and multi files are different. Follow the steps according to the condition that applies you. 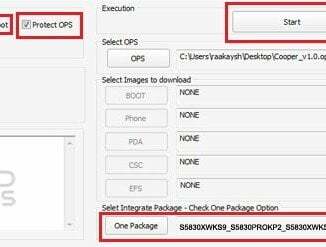 When it is launched, check the three boxes, namely “One Package”, “Auto Reboot”, and “Protect OPS” as shown in the image below. Then click on the OPS button and select the “Cooper_v1.0.ops” file. Now check the “One Package” box again if it gets unchecked. Turn off your phone and boot it into Download mode: press and hold the Volume Down + Home buttons, then long press the Power key till your phone’s screen turns up and you see the Download mode screen. Press the volume up when prompted. Click on the “One Package” button below and select the firmware file with .tar.md5 extension. Finally, click on the “Start” button and wait for the installation to finish and then your phone will reboot automatically. If the firmware package consists of 3 or 4 files, follow the following steps. 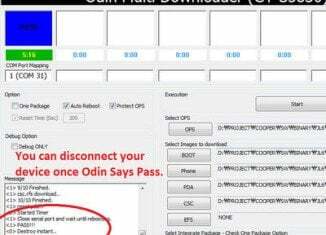 Run Odin Multidownloader for Galaxy Ace GT-S5830. Click on “OPS” button and Load Cooper_v1.0.ops file on it. Click on “BOOT” button and Select .tar (or .tar.md5) file with APBOOT in the name. Click on “PDA” button and Select .tar (or .tar.md5) file with CODE / PDA in the name. Click on “PHONE” button and Select .tar (or .tar.md5) file with MODEM in the name. Click on “CSC” button and Select .tar (or .tar.md5) file with csc / csc-multi in the name. It will take a few minutes before your phone boots up and you can see the lockscreen. Wait patiently for some time and enjoy the newly installed firmware on your Galaxy Ace S5830. Device Caught in a Bootloop? In case your device does not reboot properly and it is stuck on the Samsung logo, the steps given below would help you recover the device. Open the back cover and pull out the battery of your device. Wait for 30 seconds and then put the battery back to its place. Now press and hold the Home + Power buttons together for about 4-6 seconds till you see a green Android bot followed by a screen with blue text with Android System Recovery written on the top of it. Using the Volume Down button highlight the “wipe data factory reset” option and press the Power/Home button to select it. When you are asked to perform the action, select “yes”. When it is done, go to “reboot system now” and select it. Your phone should now boot normally. If you still find that the issue has not been fixed, reinstall the firmware. This time more carefully. how can I change the USB debugging setting if the phone is stuck in a boot loop? Can I use this for turning back my phone from jellyblast to gingerbread? why my phone cannot appear at odin…i have download all that things..??? in this rom can be applied at gt-S6200 ?? AndreyiAndrei You must have missed something while making preparations. Check things again and try. You must have missed something while making preparations. Check them again and try. It works! I did changes to vold.fstab file present in system/etc/ to swap internal memory with SD Card and now i lost access to my SDCard. If i do like this will I get my Vold.fstab file back and can access my SD Card???? My phone is still rebooting please help me out …. It is a perfectly working tutorial. Tested it several times. Just follow things carefully and do it again. In most cases users get into problem because they make a mistake. Can you see your phone’s IMEI? It is showing IMEI number but still SIM card is not detecting. and in Notifications showing no sim card inserted. what have you done after this? what have you done friend for this? why too long time when i flashing my galaxy Ace ??? Disconnect device, turn it off, boot in download mode and try again. I have a galaxy ace korean phone (SHW-M240s). I want it to convert into international version (S5830). Can this method apply to convert korean version M240s to international version (S5830)? im from philippines and i dont know what rom to download any6 suggestion pls?? Hi my ace will only load into ramdump mode and emergency download mode I tried flashing it in emergency download mode and odin gets stuck setting up connection I’ve been trying every method I found nothing seems to be working when I a jig it just shows a blue screen. Show me the screen image. Sorry I can’t upload pics @the moment as Its more then 2mb and I just realised when I use a usb jig it boots to the Samsung logo and no further. But will only connect to odin in emergency download mode. When I am putting my phone is downloading mode then my computer is says “USB device not recognized”..
Reinstall the USB drivers and restart PC. How to do this step “”Turn on the USB Debugging mode from Settings> Applications>Development> USB Debugging> check the box.””” because I don’t have these options “Settings> Applications>Development> USB Debugging>”…?? I have 4.2.2 and I want to put 2.3.6 using Odin. Plz help me out asap..
Have you connected the device to computer. If yes, select files in Odin and proceed. yes i have tried. It’s detected and everything after 6 minutes but it goes into a boot loop after successfully flashing on Odin. so I flash it using one package method is it? is it all? or do i need to do something else after the installation? Pull out the battery and enter download mode directly. Yes, you can use the steps given in the above tutorial. dude cant i installl the stock rom without odin…by moving the zip file to sd card n then flashing it in recovery mode???? Using this method does not affect EFS data. It might have been lost when you had installed a custom ROM. hey i have installed jellyblast custom rom on my galaxy ace..now i want to revert it back to stock rom….so wht do i need to do…pls explain in short…n do tell me how to remove the custom rom also ….?? The instructions are given above. 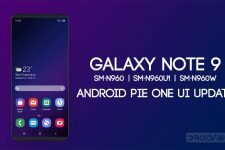 I already have a custom rom installed, so to re-install the stock rom, do i have to remove the custom rom first and then install the stock rom? No, you can install it directly. now i have my phone bricked and i need to unbrick it.. I can see you have not ticked protect OPS option. Close Odin, pull out device battery, and start over again, making sure that you do not miss anything. i think it might not be the efs folder the problem i did a factory reset and while it is formatting it says cant access system/csc/AMN/system and then it says rebooting could this be the problem on my phone ? so any idea if i can use someone elses efs data? any chance that i can use someone else efs data? EFS data? When did you lose it? That’s why we always recommend backup. I do not see it a nice solution as it’s considered illegal. Remove it and wait for some time, but if the device does not boot, pull out the battery and try installing again. Just follow the instructions carefully. also sorry for not mentioning on the first post samsung KIES says this device is not supported i already installed the samsung drivers is that a problem? Yes, it may be. Keep only one at a time. Kies will not connect if you phone has a custom ROM. Yes, you can install any firmware, Just pick one that is closest to your country and install it. why my phone not install , that , i can’t go to do usb debug beacouse my frimware are down and just say , samsung , samsung , samsung .. In that case install the new firmware using the tutorial above. Read the article again, you will find the link to solution. thks for everything. got my phone back as if factory made. Okay, I have added some firmware above. Does anyone can tell me where did I make a mistake??? As for mistakes, you better know about it. Anyways pull out the battery, and perform a wipe data/factory reset from recovery. If you backed up the previous ROM, restore it. Trebuchet is the name of the launcher used in CM ROMs. 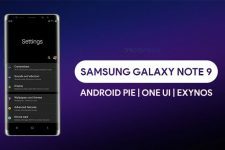 Download Nova or Apex launcher. there was no option “install zip from sdcard ” so i selected “update from sd card” and then it stopped booting up..
I’m doing a single file installation, but when i go into download mode, my phone screen just says ‘Downloading…’ and never prompts me to press the up volume key. I tried pressing ‘start’ on odin anyway, and it tells me to connect my phone. Any advice? Make sure you see Added!! text at the Message box on. If you do not, install the USB drivers, enable USB Debugging on phone, restart PC and phone, then try again. hi please i need your help. my galaxy phone Ace GT-S5830i has been block. it only displays samsung on the screen..when i try to connect to the computer through the USB, it does not read. i have downloaded firmware for vietnam and tried to flash but it shows installation aborted. the phone was produced in vietnam. please help me out. i am confused. I have’t got my actual Rom..2.3.4 i got 2.3.3…. And it is diffrent,…sad..any comments?? I cant find USB debugging in my ios rom…? Settings> Applications>Development> USB Debugging> check the box.